China's air force announced in a statement on Saturday that it conducted take-off and landing training for nuclear-strike capable bombers on unidentified islands in the South China Sea, per The Guardian. Why it matters: The South China Sea — and who exactly controls it — is one of the most hotly contested issues between the United States and China, and the U.S. has threatened consequences for increased activity in the area. The big picture: A third of world trade passes through the area — and billions of barrels of oil are beneath the seabed. China's claim, which lies within a boundary it calls the "nine-dash line," includes about 80 percent of the South China Sea. An international tribunal has rejected the scope of that claim, but its ruling is unenforceable and China ignores it. Last December, China ramped up its military presence in the sea while the U.S. focused its interests in the region on dealing with North Korea's nuclear provocations. At the start of 2018, the Pentagon's National Defense Assessment noted China's presence in the South China Sea as one of the greatest threats facing American security interests. In March, a security firm announced that it noticed Chinese spies hacking computer systems at U.S. engineering and maritime firms, particularly those with interests in the sea. 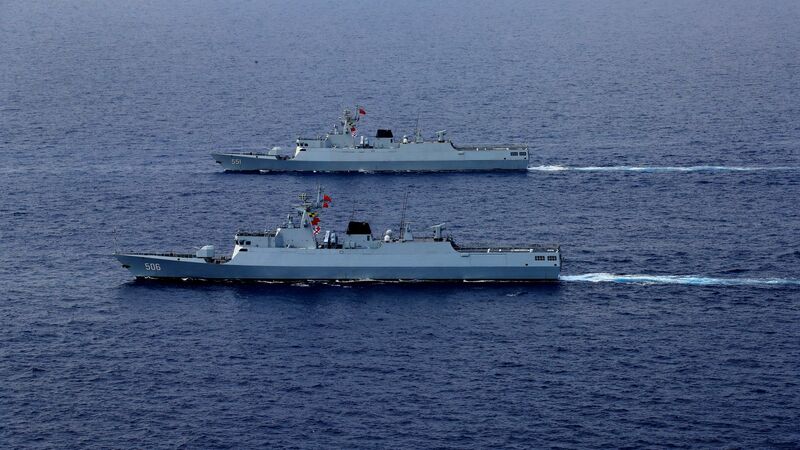 Earlier this month, China deployed anti-ship cruise missiles and surface-to-air missiles on several of the outposts it built in the Spratly Islands in the sea. Another issue: Similarly, China and Japan both lay claim to islands they believe essential to their security interests in the East China Sea. This month, Beijing and Tokyo established a military hotline this month to ensure a close working relationship as tensions surrounding U.S. trade and foreign policy grew.